We want our spaces clean and free of plastic trash! We will go to the nearby Forest Preserve to collect plastic to make our forests and trails clean and beautiful. Join us for 30 minutes of walk and pick. A joint program of the Triton College Library and Triton College Sustainability Center, we meet the first Wednesday of the month at noon in front of the A Building. 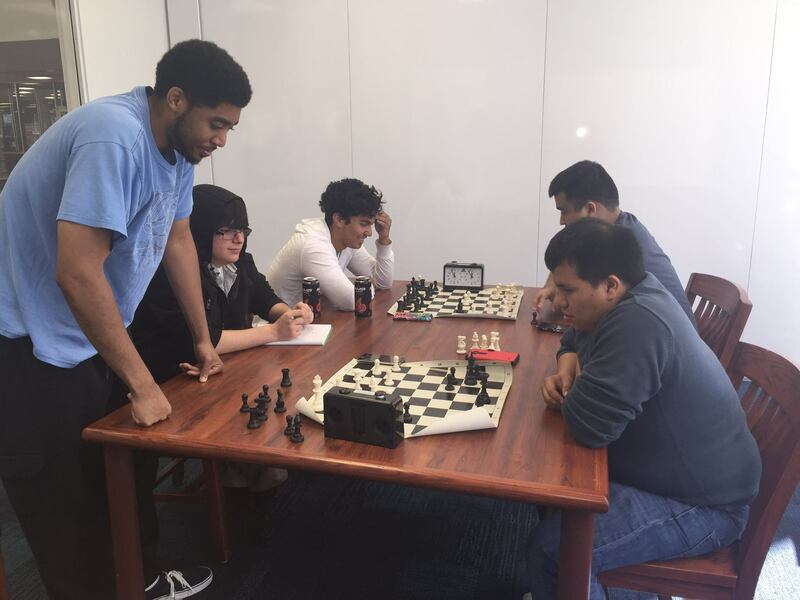 Triton College Chess Club meets in the Library every Thursday from 1 p.m. to 3 p.m. for a game or two of chess, or even a tournament. You don't have to be a member to participate. We especially encourage those who do not know how to play and would like to learn how to play chess. All are welcome! Don't just consume information--create it! Learn how to write, edit, and revise encyclopedia entries. Gain experience in online editing, science and humanities writing, creating citations, and fact and reference checking. Led by faculty advisors Dr. Dubravka Juraga (Library) and Keturah Haferkamp (English), the Triton College Wikipedia Club meets in the Library every Thursday from 2 p.m. to 3 p.m.
We post resources from past programs whenever presenters share them with us. Presented by Triton faculty member Dr. Richard Chan, April 16, 2019. All events take place in the Library unless otherwise noted. Programming is subject to change. Call Dr. Dubravka Juraga at 708-456-0300, x. 3591 for additional information. Join us for a discussion about plastics, the environmental crisis it is causing, what is being done about it, and potential solutions. Panelists include Dr. Sheldon Turner, Triton faculty member; Julie Smith, the 5gyre organization; and Adrian Fisher, Triton College Sustainability Center. Join us in a discussion about anxiety. Triton College faculty members will talk about the topic from the perspective of their fields. Be active in the conversation or just listen and analyze the different sides of anxiety. Wednesday, April 24, 2:30 p.m. In this presentation, Triton College student and recipient of the John Marshall Law School Fair Housing/Fair Lending Course Scholarship, Samuel Salmeron, will discuss the impact of the Fair Housing Act on our community. Samuel will offer an overview of the FHA's history, he will discuss the implementation of FHA protection on Berwyn, and the relevance that this civil rights era legislation still holds for us. Presented by the Behavioral Science Department in collaboration with the Triton College Library. Thursday, May 2, 3 p.m.
Free coffee in the Library on Monday, May 6 at 9 a.m.! Unwind at the Library: We will have puzzles, board games, Legos, and coloring pages available at the Library to help you relax during these busy days! We gather to talk about books we read, we like dislike, or are puzzled by. We share our thoughts and recommendations, munch on snacks, and enjoy the time spent together conversing about books and ideas. All are welcome. Wednesday, June 5, 12 p.m.